I want to help LAUNCH the campaign now! Real social change can happen and it can happen quickly. The current ‘Times Up’, ‘#MeToo’ and ‘Women’s Marches’ movements are evidence of this. Gender equality campaigns of the past have been successful because they were driven by fact-based awareness campaigns in the main-stream media which were supported by thousands of advocates across the community. The time is now, its time for change. Learn more about the statistics behind our latetst campaign. 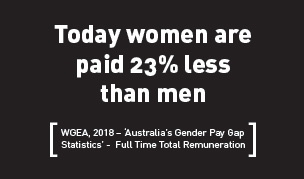 This statistic is taken from the Workplace Gender Equality Agency’s 2017 ‘Australia’s Gender Equality Scorecard – November 2017. It seems disingenuous to cite the ABS average weekly earnings data which only takes into account salary when looking at the current gender pay gap. The ABS data reports a gap of 15.3%, which is the figure most often cited by politicians and the media, whereas, if we take full remuneration including bonuses, overtime and other forms of remuneration into account, the pay gap is actually 22.4%, which is a significantly higher number. The gender pay gap itself can be explained by the significantly higher number of men in senior higher paid roles, the predominance of men in higher paying industry sectors, the effects of uninterrupted service by men on positions within salary bands and finally discrimination and bias in recruitment, selection and promotion against women generally. This statistic was reported by the Australian Human Rights Commission ‘Face the Facts – Gender Equality 2018’ report and is taken from the Australian Bureau of Statistics 2016 ‘Personal Safety Survey’. 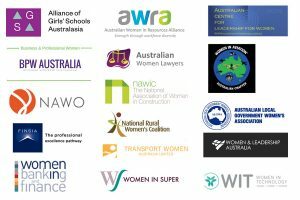 A sobering statistic that reveals that over 2,000, 000 women, over the age of 15, have experienced sexual violence in Australia. 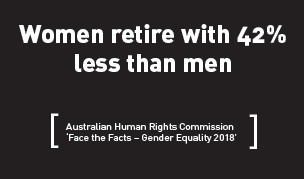 This statistic is taken from the Australian Human Rights Commission’s ‘Face the Facts – Gender Equality 2018’ report. The significant disparity between men and women arises primarily because of the gender pay gap’s compounding effect upon returns on superannuation fund balances, as well as women being absent from the workforce for longer periods than men due to caring responsibilities. 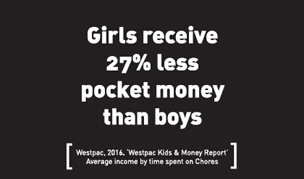 This statistic is taken from the Westpac ‘Kids and Money’ Report, 2016. When pay is divided by hours worked to earn it, girls receive on average 23% less than boys. Further, the report shows a very clear delineation between ‘boys work’ and ‘girls work’. The patterns which we can observe in the workforce are being replicated in Australian homes, contributing towards the perpetuation of gender inequality into the next generation. It is worth noting that the Heritage Bank ‘Aussie Guide to Pocket Money’ report in 2015 showed similar gender disparity in pocket money and average hours spent earning it. 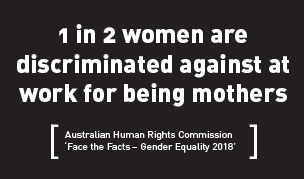 This statistic is taken from the Australian Human Rights Commission’s ‘Face the Facts – Gender Equality 2018’ report. Because over 90% of working women are the primary carers of children, they often suffer discrimination caused by work life conflict and the lack of flexibility in the workplace. This burden is exacerbated by the unequal sharing of domestic labour in Australian households. This persists between couples even where the primary earner in the household is the woman. Women often suffer discrimination even where there is no manifest conflict, rather employers perceive that there could be conflict and pre-empt or act accordingly. This can take many forms, from potential job assignments being withheld or reassigned to outright ‘redundancies’ and ‘restructuring’ being used as excuses to sideline working mothers. Song Suffragettes is a collective of female singer-songwriters who perform every Monday night in Nashville, TN USA. With a mantra of #LetTheGirlsPlay, Song Suffragettes has featured over 200 women in the past 4+ years resulting in multiple publishing and record deals for some of music’s brightest female talent.